(《複数形》 gazelles，gazelle) 【動物, 動物学】 ガゼル 《ガゼル属などの各種の小型のレイヨウ; アフリカ・アジア産》. From French gazelle, from Old French gazel, from Arabic غَزَال‎ (ḡazāl). 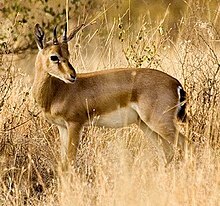 An antelope of either of the genera Gazella (mostly native to Africa) or Procapra (native to Asia), capable of running at high speeds for long periods. A GAZelle (Russian: ГАЗе́ль) is a series of mid-sized trucks, vans and buses made by Russian car manufacturer GAZ. GAZelles are similar to the later launched GAZ-2215/GAZ-2752 Sobol and GAZ-3310 Valdai line of vans and light trucks. GAZelle, Sobol, and Valdai account for the majority of the Russian van and light truck market, and rank as GAZ's most popular and successful products.